My darling Mr Q loves ham. Just adores it. I’ll often find him crouched by the fridge in the dark, quietly folding ham into his mouth, trying not to be noticed. We probably go through hundreds of kilos of ham per year, it’s ridiculous. And expensive, if you buy the good stuff. This week, I decided to have a go at cooking my own gammon – or confusingly, ham, as the finished baked product is called. Having no clue what I was doing, I purchased a 2.5 kilo gammon from Tesco on a whim and bought it home. It sat on the counter while I Googled the best method to cook it. There was a ton of information out there – from overnight soaking to cooking in coca-cola or studding with cloves and slices of orange. Massive confusion ensued. So, I decided to wing it. Sans recipe. I could remember snippets of my grandfather’s recipe, so I put what I knew to use and bluffed the rest. Pop the whole joint of gammon into a large pot of boiling water with a whole quartered onion and some whole peppercorns. Simmer away for about 45 mins (less if your gammon is smaller than mine). Remove ham from the pot, but don’t discard the stock just yet. Score the rind in a pretty diamond shape if you so desire, or just slash haphazardly like I did. Plop the ham into a big baking dish. Massage three large tablespoons of wholegrain mustard into the meat, then drizzle with three large tablespoons of golden syrup. Ladle a cup of the cooking stock into the bottom of the baking dish so that steam is created when you cover with foil. Cover with foil loosely and pop into the oven at 160 degrees for 1.5 hours. Remove the ham from the oven and take off the foil. Pop the ham back in the oven at 220 degrees for 30 mins. Rest for five minutes, then carve! The resulting ham was delicious, if a little salty. The only change to the recipe I’d make for next time is to heed the advice I found online about soaking the gammon overnight to remove a lot of the salt. Otherwise, it was great. We’ve been eating the damn ham for three days now. In sandwiches, with eggs, aside salad. Mr Q has been sneaking out to the fridge to stuff wafer-thin slices into his gob. Success. But next time, I think we’ll go for the smaller gammon. Tags: cooking, food, gammon, ham, pork, recipe. Bookmark the permalink. Delicious! 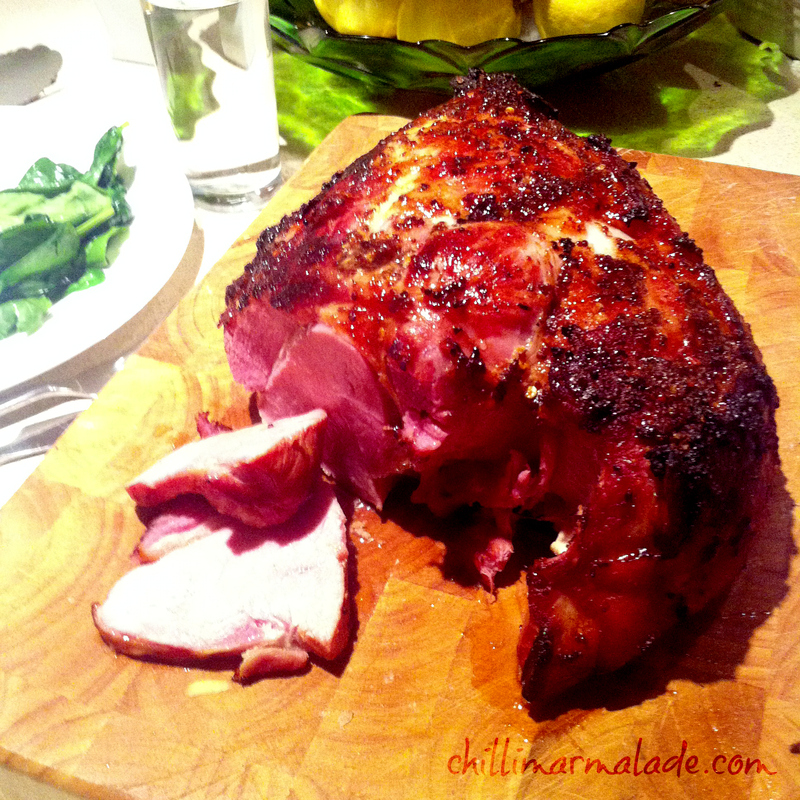 I really love glazed ham… will have to try this at Christmas. That reminds me of the day my fiancé cooked gammon for me who had never tried it 🙂 Yours looks nicer though. Gorgeously delicious! Love the glazed ham!! Wow, that’s a lot of ham to start with – you are very brave. I am right this minute testing out a recipe for putting gammon in a slow cooker with brown sugar underneath it and on top of it. 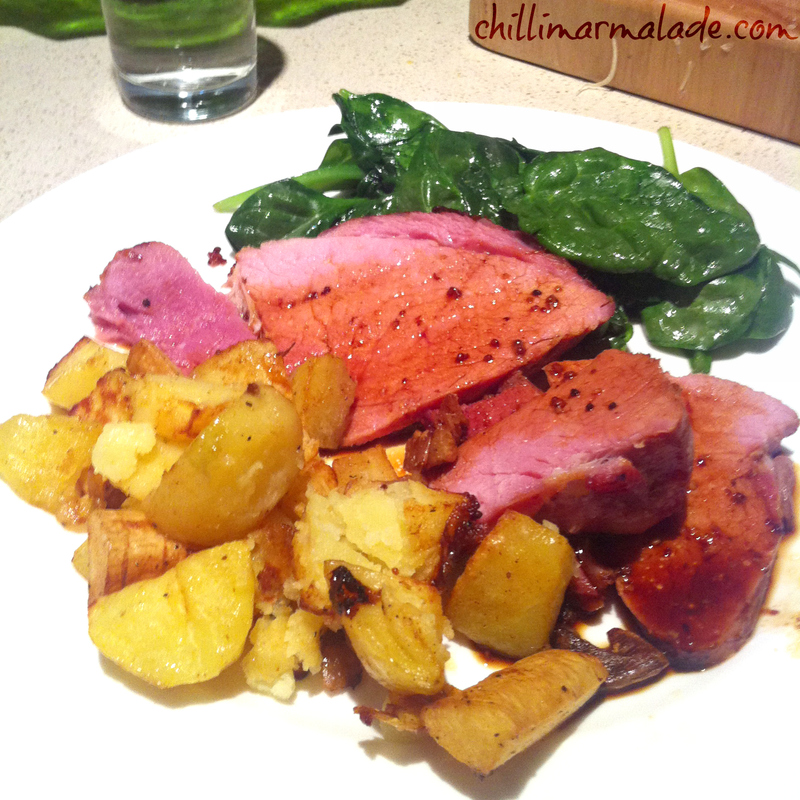 If anyone is feeling inspired – Co-op are selling 1.1kilo gammons for £5 (hence my ham-cooking), usually £10. Brilliant – thanks for letting us know about the deal at Co-op! Hope your brown sugar gammon works out well. Chili-M – Nice post. Reminds me of the baked hams at our house years ago. Honey mustard glade topped with pineapple rings. I love gammon – part of Christmas is going home to my parents and hacking off slabs of my mum’s gigantic ham joint to go with home made bread and cheese after a night down the local with my brothers! I think it is possible to get gammon joints that don’t need soaking or are pre-soaked – depends on if it is supermarket or a butcher maybe. I definitely made the mistake once and didn’t soak, and had a very very salty joint. Your pictures are making my mouth water and looking forward to Christmas! Looks great! Have done gammon with honey n cloves but never used syrup. Will try!! This looks delicious, and your photography is excellent! I highly recommend the Coca-Cola method. I can hardly think of a better use for a 2-litre bottle of Coke (just don’t use the Diet stuff). Yum – that ham looks good. Thanks for checking out House of Bedlam! I’m with Mr Q. That ham looks truly delicious. I also love to eat roast ham cold from the fridge a day or two after it was cooked, with some pickled onions, yum. I have a recipe that roasts the ham with fresh peaches which is also nice. Oh and thanks for dropping by my blog, hope you drop by again soon. Thanks for liking my post about Spicy Bacon Omelette on WordPress http://williskitchen.wordpress.com/ Look forward to reading about your tasty adventures in the kitchen and off. Ah the sneaky fridge snack, is there any tastier sort? Will have to try this recipe out next time I bring some gammon home from the supermarket. Thanks!